You’ve heard of the little piggy that went to market, but what about the little moose? 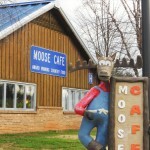 Moose Cafe is a North Carolina born and bred country restaurant with two locations in the state. Both Moose Cafes are located in farmer’s markets, making their access to fresh and seasonal vegetables convenient and giving new meaning to the phrase “farm to table.” The first restaurant opened more than fifteen years ago in the Western North Carolina Farmer’s Market of Asheville, and the second opened just a few years ago in the Piedmont Triad Farmer’s Market in Colfax. With only two locations in one state, you could say this moose is little, but authorities such as Our State and Southern Living have consistently recognized Moose Cafe for its delicious Southern cuisine. Of course, I didn’t know this history. I, for some reason, had my doubts about a restaurant in a farmer’s market, as my family and I drove towards the Moose Cafe in Colfax to celebrate my sister’s college graduation. 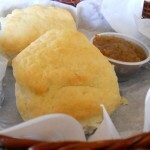 But both the friendly moose statue by the door, the Western-style wooden booths and homey decor, and the freshly baked biscuits – garnished with slightly chunky, in-house apple butter – that greeted us at the table set me at ease. 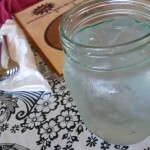 When our sweet teas were served in jars, I knew the best was yet to come. The waitress arrived to take our order after a few minutes, but none of us were ready to choose just one item from the menu. Thankfully, they had counted on that. By the time the waitress returned to take our order again, most of my family members had spotted the Moose Sampler: our choice of two meats and three vegetables from a huge selection of country favorites like meatloaf, barbeque, chicken ‘n’ dumplings, baked ham, hamburger steak, and mashed potatoes, green beans, fried okra, pinto beans, butternut squash, and collards. And then when they brought the food, the servings were huge. No one’s food fit on one plate. 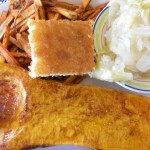 Meals were served with cornbread with real corn in it. My mom’s turkey was so tender she could cut it with a fork. My sister’s macaroni and cheese disappeared. My sweet potato fries were seasoned with the perfect hint of cinnamon. A great silence fell on everyone at the table as we feasted. When we finished, we still had enough left on our plates to feed nine more people. I ate leftovers for days and didn’t complain a bit about it. My stepdad probably enjoyed the bill most of all, which was under $9 per person. 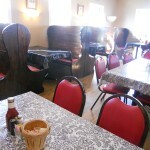 Moose Cafe exceeded my expectations, with its quaint setting, comfortable atmosphere, and filling country food. It’s no wonder they recently won Best Overall Restaurant in the Triad. Written by: Celeste Hawkins on December 20, 2011.on December 22, 2011. I do not agree with the assessment of Moose and I am also surprized about their best in triad. I feel you are correct about the ambiance, but the food is certainly lacking in many areas of even the most crude palate. The portions are healthy as you have stated. This point is very true. It is the product itself in which I have issue. It has not a soul nor does it have the Farmers Market fresh in which it should. In a word; dissapointing.